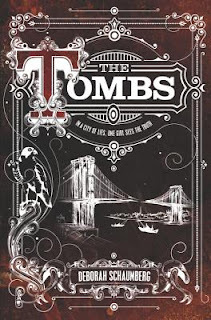 The Tombs, by Deborah Schaumberg (Harper Teen, Feb 20 2018), is a tense and atmospheric story set in an alternate 19th-century New York, where zepplins are common-place, but conditions for workers in the factories are much as they were in real life (which is to say, bad). Avery is one of those workers; she's a welder, a skill picked up from her mechanical genius father, and despite the fact that she's a girl, her skill has gotten her a job (with miserable hours and working conditions, but still desperately needed). Her father came back from the Civil War pretty broken, and though he found love, set up a shop selling clocks and mechanicals, and things went while for a bit, he was broken once more when his wife was taken from him. The crow-masked goons working for the insane asylum in the basement of the Tombs, the city's notorious prison, came for her a few years before the story begins, and Avery hasn't seen her since. But now the Crows seem to have set their sights on Avery, just as she is beginning to manifest the same psychic gifts that drew their attention to her mother. Questioning her own sanity, she finds reassurance from the Gypsy community living outside the city. (NB: yes, Gypsy is the word used. The author explains this by saying that this is the word 19th-century New Yorkers would have used. But since they call themselves Romany, it doesn't seem like it would have taken much effort to have them explain to Avery that Gypsy is offensive, so that she and the author could have quit using it). With the help of the Romany, Avery begins to understand her gifts, and begins to think that she can rescue her mother from the Tombs. But the task in front of her gets more monumental when she finds out what the whole sinister purpose of the "mental asylum" actually is. Horrible experiments are being carried out there, that could jeopardize the hopes of the working classes for a better life.... And when Avery herself is captured, and turned into a lab rat herself, her hope that she can be a rescuer dims even more. So if you enjoy dark urban YA with a generous dollup of romance (two very worthy and helpful young men are present as love interests), a sprinkle of steampunk (incidental mechanicals as well as zeppelins), in which there's lots of atmospheric buildup before thing really get going in the last 200 pages, and if you appreciate a book where the female protagonist is a brilliant welder, has a hawk, and can do cool things with auras and life forces, and most importantly, if you can over look the grating, incessant use of an offensive descriptor, you will enjoy this. I personally found it very readable, though not exactly my preferred cup of tea (dark and urban isn't my preferred thing), and though it was slow at times, a tad too New Age during the exploration of psychic gifts when Avery is first with the Romeny, and I was grated to the limits of my endurance by the use of "gypsy". Seriosuly, it wouldn't have been hard to just switch to Romany, or better still, Romani. "Fortunately, even in dark prisons, there are friends..." Very intriguing! Thanks for the review.